Over the past decade, MLB Network’s presence at the All-Star Game festivities has grown each year. That’s true once again in Washington, DC, this week — not only because of the 14-plus hours of live onsite programming on MLB Network but also thanks to a cavalcade of events being live-streamed across MLB platforms. 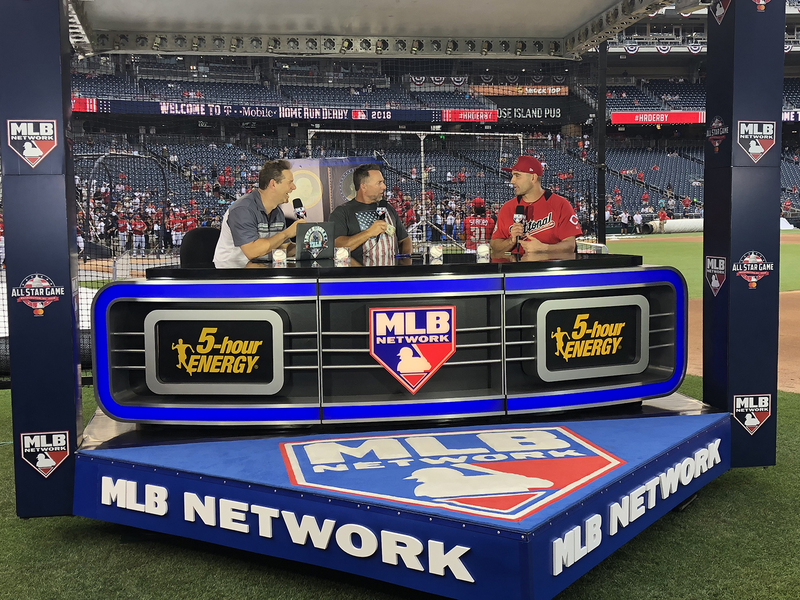 In addition, MLB Network continues to handle the MLB All-Star Game world feed and Futures Game production and continues to expand its FATS (feed another trailer something) system to further streamline sharing of video feeds among onsite broadcasters. MLB Networks’ (from left) Tom Guidice, Jason Hedgcock, and Susan Stone are leading the ops and engineering efforts at MLB All-Star in Washington D.C.
During All-Star festivities this week, MLB Network is responsible for live productions of 32 discrete events across six delivery platforms (MLBN, MLB.com, Twitter, Facebook, Twitch, and 15 Seconds of Fame). To illustrate just how much MLB Network’s All-Star effort has grown over the years, here’s a look at the operations team’s Monday-afternoon schedule. The MLBN operations team was tasked with managing five nearly concurrent live productions: MLB Tonight: All-Star Media Day on the network; 12 individual Media Day pod feeds on MLB.com (plus distributing these feeds to broadcast partners); the Commissioner’s Town Hall on MLB.com; the MLB Home Run Derby VR Championship at FanFest streaming on Twitch, YouTube, Facebook, YouTube, and Mixer; and the All-Star press conferences on MLB.com. And that’s not even including the Pitch, Hit, and Run Championship; USAA Selection Show; and Perfect Game Selection Show earlier in the day or the BP Show that evening — all streamed on MLB.com. MLB Network has rolled out seven mobile units to handle this parade of shows: Game Creek Video’s Maverick (for All-Star world feed Tuesday and the All-Star Futures Game and Armed Services Classic on Sunday), Riverhawk (for MLB Tonight, High Heat, and Intentional Talk studio shows), Webby (Red Carpet Show on Tuesday), Edit 3 (primarily for at-home–production needs), Edit 4, and Freedom (VR HR Derby) — plus a full trailer dedicated to media management. In addition, Admiral Video is onsite with its own truck handling 12 live pod feeds from Monday’s All-Star Media Day. 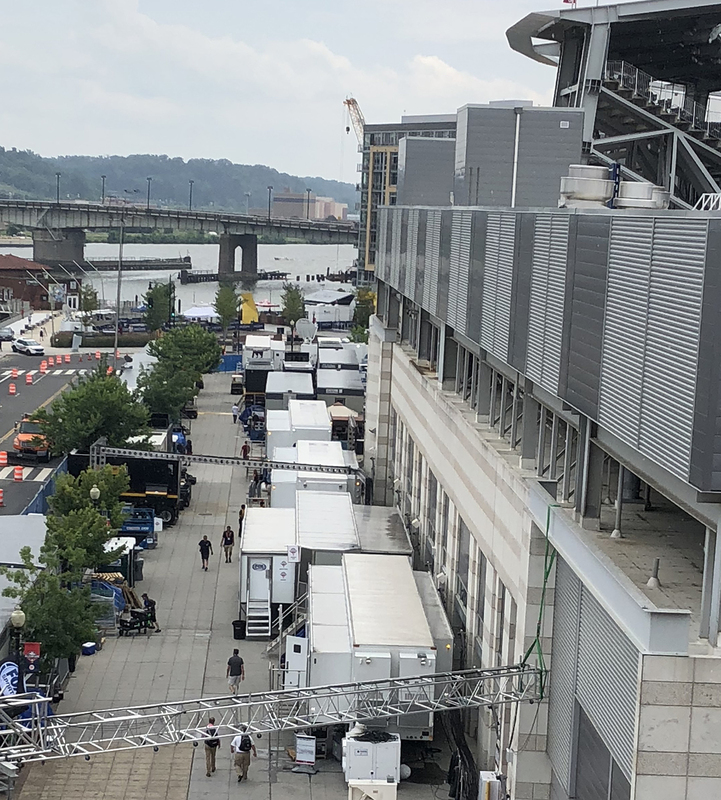 Fox Sports and MLB Networks’ truck compounds are split between the truck dock inside and this outdoor area adjacent to Nationals Park. To deal with the onslaught of All-Star’s live-streaming shows, MLB Network is heavily leveraging its broadcast center in Secaucus, NJ. Inside Edit 3, the network has created a “REMI suite” — with its own audio console, video control, and comms infrastructure — handling the bulk of the MLB.com-only shows. The suite is linked to two control rooms in Secaucus, where the shows are being produced. 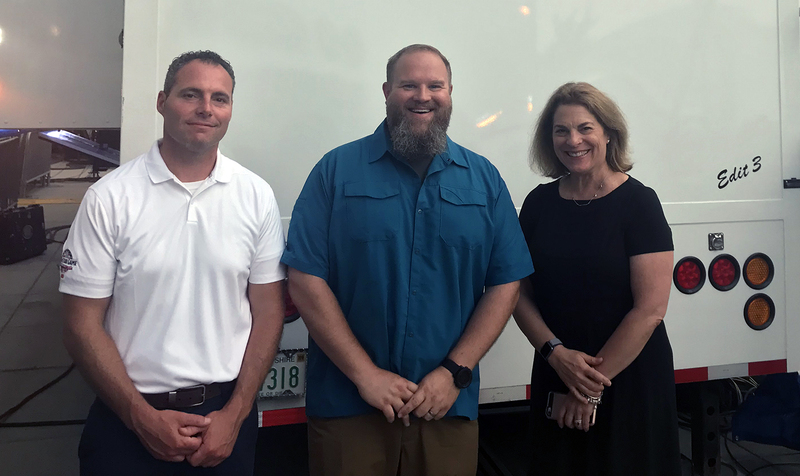 The continued expansion of MLB Network’s FATS system has greatly benefited the network’s onsite operation, as well as streamlining its content distribution to broadcast-rights holders onsite. “We have had the FATS system as a feed station that goes out to everybody in the past, but we’ve taken it to the next level this year,” says Hedgcock. “One of the challenges for this event is, each rightsholder has monitors that show feeds from eight total locations in the building. In the past, each broadcaster put out their own hardware, or we’ve shared hardware and tried to swap feeds. It wasn’t the most organized system. MLB Network’s pregame-coverage plans for both the Home Run Derby and the All-Star Game are as comprehensive as ever. The network was live from 2 p.m. to 8 p.m. on Monday with live editions of MLB Tonight (both during Media Day and then at 6 p.m.), High Heat With Christopher Russo, and Intentional Talk. 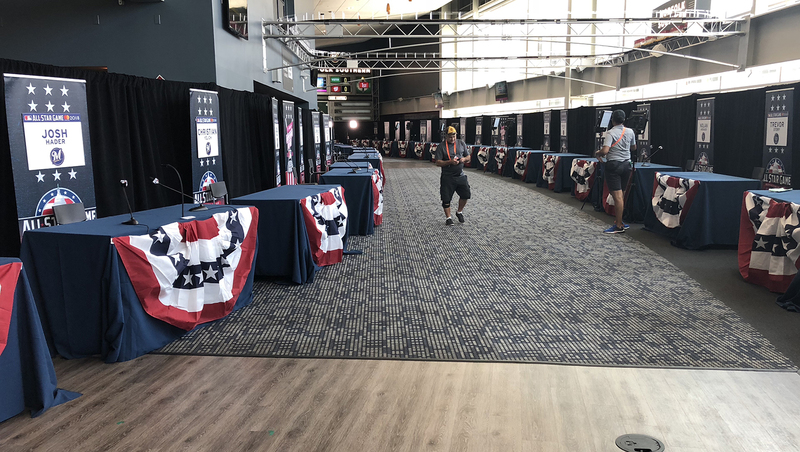 It’s another full day today, with the All-Star Red Carpet Show at 3 p.m., the three studio shows leading up to the All-Star Game at 8 p.m., and MLB Tonight Postgame after the game. MLB Network’s main on-field set underwent a refresh for this year’s All-Star festivities. 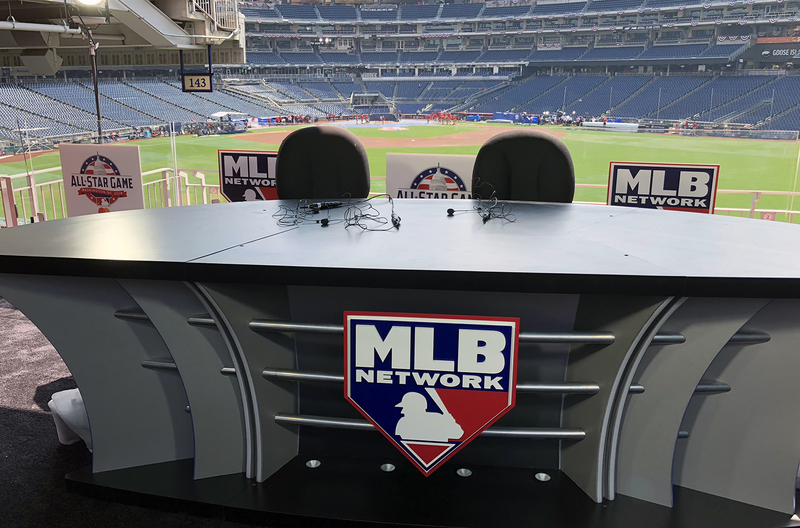 MLB Network is deploying two sets for all its pregame coverage: its main on-field set on the first-base line and a second set on the concourse — both provided by Filmwerks. MLB Network is deploying a whopping 48 cameras between Nationals Park, Play Ball Park, and the Red Carpet Show. To cover the field throughout the pregame, as well as for its caravan of shows during the All-Star festivities, the network has added an RF Steadicam to an RF handheld used in previous years. The pregame show will also have four up cameras to cover the field (plus an aerial shot provided by AVS), as well as the two hard cameras and jib at the on-field set. MLB Network will have two activations during the Red Carpet Show (which will be more similar to a traditional awards show than to the parade of recent years): a standup-interview location with Lauren Shehadi and a host location with Greg Amsinger and Harold Reynolds. Filmwerks is providing a Z stage at the end of the red carpet to conduct these interviews. Fletcher is also mounting multiple robos on the roof of the adjacent garage to capture overhead shots of the proceedings. As part of its extensive social-media coverage, MLB Network will also have Cliff Floyd on hand as its Red Carpet fashion reporter. And, not to be forgotten, MLB Network once again produced the MLB All-Star Futures Game on Sunday, deploying seven hard cameras and an RF camera and debuting the SkyCam system in left field that Fox Sports will be using tonight for the big event. MLB Network also deployed ActionStreamer POV-style HelmetCams on the bullpen catcher and first-base coach (the technology was also used on roving on-air talent during its pregame coverage on Monday). No MLB Network All-Star production has grown as much as Media Day over the past few years. Once a small piece of the All-Star puzzle, Media Day is now a major undertaking in which the operations team is responsible not only for content airing on MLB Network but also for delivering live camera/audio feeds from interview pods to MLB.com, Fox Sports, ESPN, all MLB team sites, and various other outlets. No MLB Network All-Star production has grown as much as Media Day over the past few years. 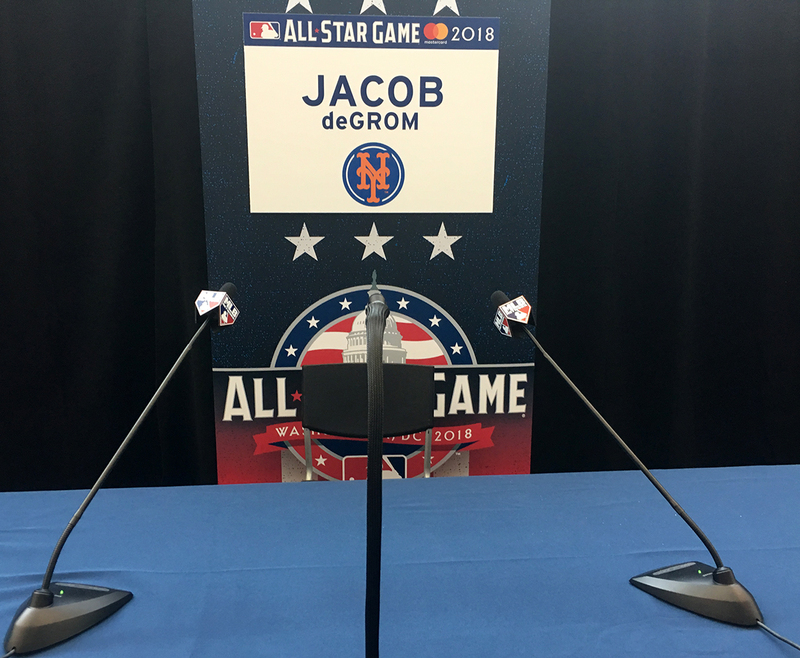 Also this year, MLB Network worked with Admiral Video to deploy 12 Marshall miniature gooseneck robotic cameras on interview pods for Media Day (plus a robo overseeing the entire room). The systems, which were also used for Stanley Cup Media Day, marry the audio from two mics at each pod and feed to Admiral Video’s truck onsite, where they are shaded and sent on to the FATS system for distribution to various outlets.